Jason Hartman talks with Speaking Empire’s CEO, Dustin Mathews. Dustin was the 2010 Speaker Coach Of The Year and 2010 Infusionsoft’s Marketer of The Year Finalist. The two discuss the right steps to take to start a success speaking career. 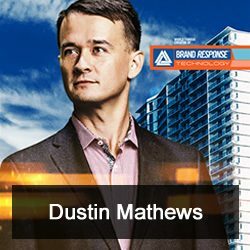 Dustin is the author of How To Get Rich Working For FREE, and Secrets of the Real Estate Millionaires, and loves the challenge of turning a rookie speaker into a sought after headliner. Speaking fundamentals are the same now as they’ve always been: establish credibility, provide some social proof, tell interesting stories, give the audience an enticing offer. The mindset of your audience, however, has changed and old strategies and techniques are sniffed out and avoided a mile away. So if you’re getting lower conversion and sales rates than you have before, it’s likely your audience turning away from your sales pitch, not your message. If you want to really have a successful career, you HAVE to learn the new formula for selling your audience.